An economic minnow but a geographic titan, Mongolia is of growing strategic interest to both the US and China, writes J Berkshire Miller. ‘Economic powerhouse’ isn’t a term usually associated with Mongolia—lack of development, political uncertainty, and limited resources continue to restrict its growth. Nor is ‘strategic pivot’—Mongolia is, after all, a landlocked country with no ports, a small army and an underdeveloped infrastructure. And yet numerous countries in the Asia-Pacific region and beyond are starting to recognize that this geographic titan (it’s larger than France, Spain, and Japan combined) has real potential to become a key strategic partner. China, Japan, South Korea, India, and Vietnam all already maintain missions in the dusty capital, Ulan Bator. But interest extends beyond regional neighbours—the United States, Canada, Australia, and several European Union states have also indicated they are keen to boost bilateral ties. Why the interest? In the cases of China and Russia, shared history and geography make Mongolia an essential strategic partner for a country wanting to hedge against one or the other (or both). In addition, Mongolia’s eastern border with China is less than 1000 kilometres from North Korea, making it an intriguing potential partner on security issues. Mongolia may not have the aspiration—or capacity—to develop a strategic weapons defence system, but a collapse of Kim Jong-il’s regime could mean all bets are off. Either way, Mongolia has been developing increasingly close security ties with the United States. 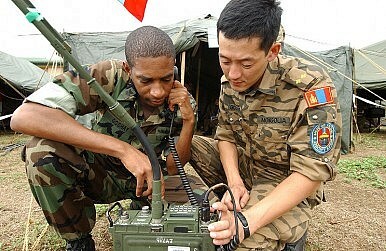 Through the International Security Assistance Force (ISAF) in Afghanistan, Mongolia contributed about 150 soldiers from the elite Mongolian Expeditionary Task Force (METF)—a sizeable number considering the country’s population—to help train the Afghan National Army in mobile field artillery techniques. While nearly two-thirds of the METF in Afghanistan have now returned home, such moves have bolstered the broader relationship with both NATO and the United States. This deployment has also built on the US goodwill Mongolia secured through its troop contributions to the Iraq War, which prompted visits by then US Defense Secretary Donald Rumsfeld and then President George W. Bush—the first sitting US president to visit the nation. And the Obama administration has indicated that it intends to build on this progress. Last August, the Mongolian Armed Forces (MAF) and the US Pacific Command conducted its annual joint-training exercise, ‘Khaan Quest,’ which was first undertaken in 2004 and is aimed at further enhancing the MAF’s expertise in peacekeeping and counterterrorism. Khaan Quest continues to attract observer and participating nations from across the globe, with South Korea, Thailand, Canada, India, Japan, and Fiji all in attendance recently.